More than 10,000 spectators in the Mercedes-Benz Arena no longer kept their seats. When the 21-year-old German Luc Ackermann finished his final round with the double backflip Nac Nac on Saturday at 10:15 pm and showed the winning spot, the audience shouted his name full of enthusiasm. After his incredible victory at the World Cup opening the day before, the German Red Bull athlete was able to defeat the five-time World Champion Maikel Melero on the second day of the NIGHT of the JUMPs in Berlin. He leads the FIM Freestyle MX World Championship confidently with 40 points after the first two competitions. In addition to the two main players Melero and Ackermann Libor Podmol, Pat Bowden, Rob Adelberg and Leonard Fini could qualify again for the final. For the Berlin local hero Kai Haase unfortunately after the preliminary round was over. He won the victory in the synchro contest on the side of Leonardo Fini. Javier Villegas, FIM World Champion of 2011, missed the finals in seventh place. Petr Pilat, Czech European champion of 2017, injured his hand the day before, but still drove and became honorable ninth. Filip Podmol was only 11th after a great run that ended in a hard crash. X Games winner Rob Adelberg opened the finale and unpacked his new Body Varial in the Double up, with which he recently won the Winter X Games in Aspen on the Snowbike. Despite this incredible trick premiere, it should not be enough for him for the podium. He was able to intercept Leonardo Fini, who crashed his California roll, but that was all. The second Australian Pat Bowden changed his run from the day before and received 332 points from the judges with his incredible style. As Libor Podmol but the California Roll jumped in a double up, the experienced Czech from the Australian still from the third place. Now it was up to Maikel Melero to put pressure on his final run Luc Ackermann. The Spaniard had his best NIGHT of the JUMPs run ever followed, as he himself said. With insane tricks like the Nac Flair, the California Roll, the No Hand Frontflip, the Seatgrab Flip and the Superflair he showed everything he currently has in his bag of tricks. There were whopping 385 points from the jury. Then came the German Freestyle Terminator and ran a final run that made history: Holgygrab to Rock Solid, Egg Roll, Flair, Seatgrab Indy Flip, Front Flip, 360, Surfer Tsunami Flip, Clicker Super Flip, Double Backflip, 9- O-Clock and the Double Backflip Nac Nac. The Thuringian athlete slumped 399 points and the party in the sold-out Mercedes-Benz Arena boiled over. What an incredible start to the new FIM World Cup season was! Already it’s back to a duel between the young German and the experienced Spaniard hammering a trick level from another star into the dirt. The remaining athletes are currently only supporting actors in the World Cup circus. Two months freestylers now have time to recover and work on new tricks. Will the others manage to break the duel between Luc and Maikel? The answer will be on 26./27. 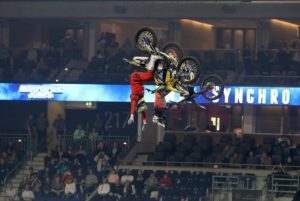 April 2019 at the NIGHT of the JUMPs in the Olympiahalle, when the next championship points will be awarded. The Berlin FMX fans can look forward to the 21./22.02.2020. Then the NIGHT of the JUMPs comes back to Berlin. From Monday, the advance sale on www.eventim.de starts with an Earlybird rate of 10 € discount on each category. In addition, a new ticket category with 39.90 euros and a 50% discount for children will be introduced. So you can get a kids ticket for incredible 10.00 Euro. The NIGHT of the JUMPs World Tour will be fully live on www.nightofthejumps.tv this year. Fans around the world can also experience the events in Brazil and China live and cheer them on whether the title of the FIM Freestyle MX World Championship for the first time goes to Germany.